33 Grosvenor Place, London, which appears to be an office building, stands directly across from Buckingham Palace gardens. The iconography decorating its upper storeys is nothing short of startling, and makes me wonder if there is / was something significant going on in this building - such as intelligence operations. At the top of the central columns are several god-like figures - or perhaps apotheosized men - holding on to and seeming to control what appear to be demons! The tall figures have three rays emitting from their heads, similar to the Statue of Liberty, while their short, gimpish slaves appear in different contorted positions, most with their mouths gaping open. I believe the collective figures represent the higher and lower natures of man, the macrocosm and microcosm, above and below, order and chaos. All of the man figures seem to be slaying their demons. Both the men and demons have wings. They remind me of the half-angel, half-devil characters on the coat of arms of London Freemasonry, shown below. These two angel-devils are in fact the very cherubim which protect the Ark of the Covenant. What's most interesting about the figures is that the angel figures are all male, the demons are female - all showing breasts, and hooves, and most of them appear to be pregnant - and -- most shockingly -- the angels are stabbing or lancing the demons' pregnant abdomens! This suggests two things to me: firstly, the concept of "slaying your lower nature", and secondly the ritual 'cremation of care', as the angel-men are slaying babies in the wombs of the demons - probably their own offspring - born of a union between the angel and the demon in question - which ties in with child sacrifice to Moloch. It's really quite shocking. 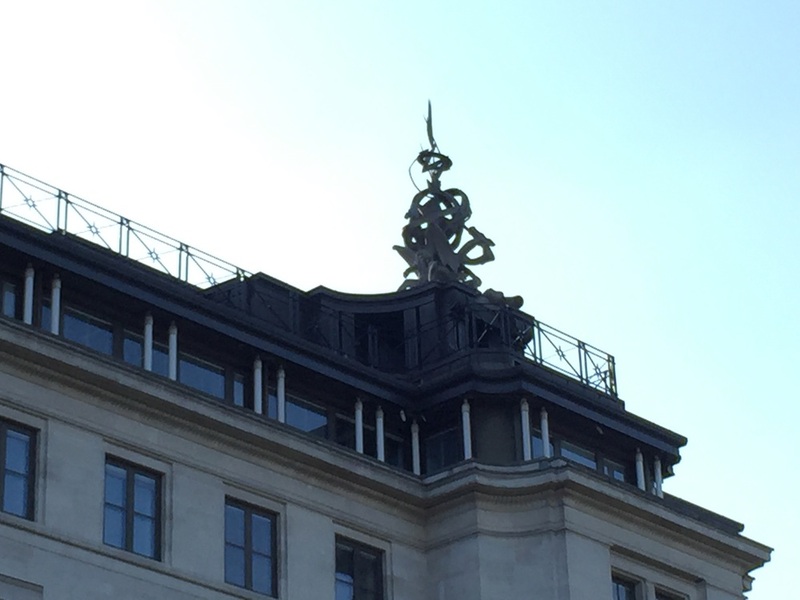 Then on top of the building, on both ends left and right, are amazing globe shapes being held up by what appear to be dragons. Into the globe shapes is crashing a lightning bolt - presumably signifying the power of Lucifer / Zeus / Jupiter. 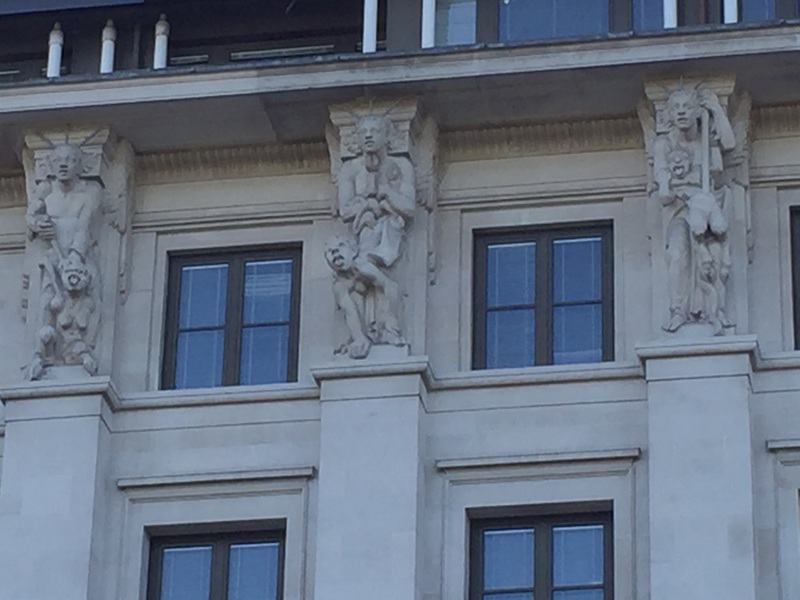 33 Grosvenor Place displays incredible iconography, the likes of which I have not seen elsewhere. If anyone has any interpretations of the iconography they'd like to share in the comments below, it would be appreciated.